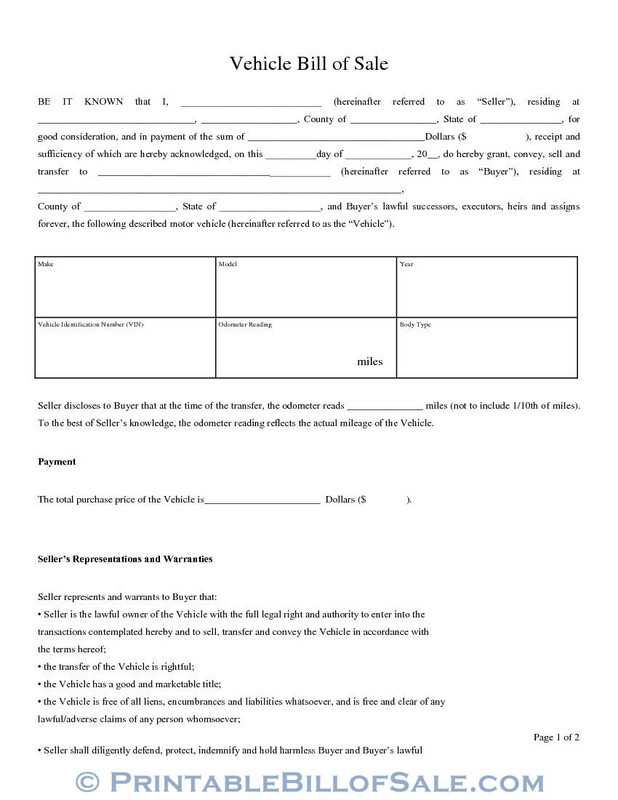 Blank Vehicle Bill of Sale is used while buying or selling a vehicle in the USA. This bill is a legal document and is governed by the Federal law; it is the general bill which can be used in the whole of USA unless a State has developed its own bill of sale. 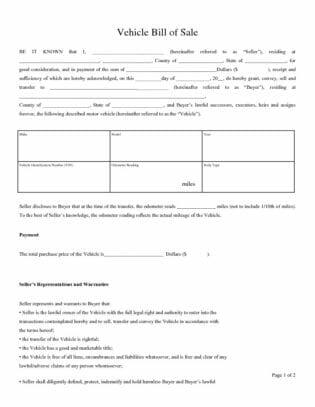 This blank vehicle bill of sale contains comprehensive information about the seller, buyer and the vehicle and it provides safety to both the parties. This bill can be produced as a legal document in the court of law of USA. It is a kind of declaration by the seller, in which he gives his full name, full residential address along with his country and State. Date, month and year are also mentioned in this section of the bill. In the blank vehicle bill of sale, the seller mentions the amount in US dollars for which the vehicle is being sold. The name of the buyer, his complete address and the name of country and State is given in this section. The seller also declares that he has transferred the ownership of the vehicle to the buyer and his/her successors, heirs and executers forever. In this section complete detail of the vehicle is mentioned. Make (company’s name), model, year of manufacturing and vehicle identification number (VIN) is given in the relevant columns. Odometer reading is also given in miles, which means how many miles the vehicle has travelled so far and it is the actual mileage travelled as per the seller’s best knowledge. Body type (sedan, station vegan, car, etc.) is also mentioned in this section. Payment: The total purchase price in US dollars is given here and it is in words and figures both. Seller is fully authorized to sell and transfer the ownership of the vehicle, as he/she is the sole lawful owner of the vehicle. 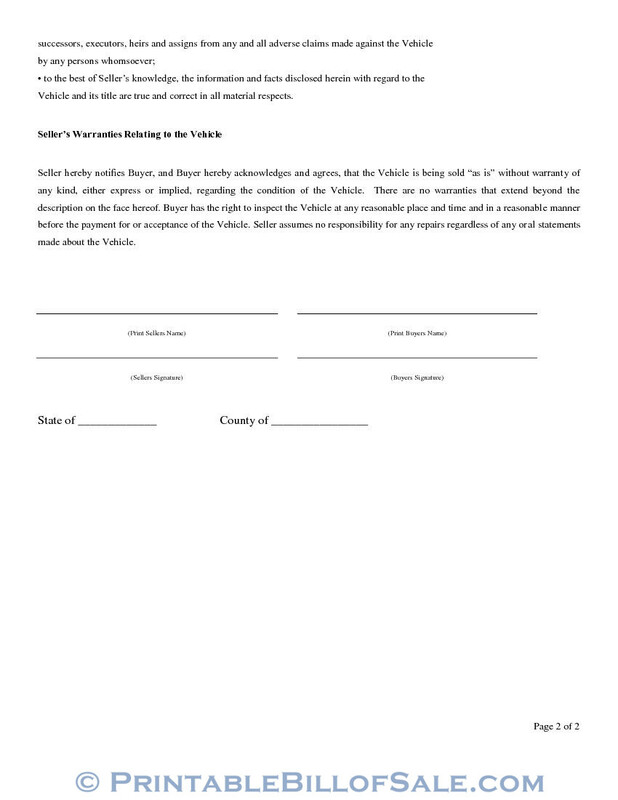 The sale of the vehicle is lawful. The vehicle owns a good marketable value. There are no liens, liabilities, burdens on the vehicle and it is free from all adverse lawful claims from any person/organization. The facts and information given here are correct according to the best knowledge of the seller. Seller notifies the buyer and he (buyer) permits and acknowledges that vehicle is sold on, “as is” basis and the seller will not take any responsibility for any defect/s found afterwards. Buyer has the full right to inspect the vehicle thoroughly and make his satisfaction about the condition of the vehicle before making the payment. No claim will be accepted once the charge has been taken. In the end name of the seller, his signature and name of buyer along with his signature are affixed to vet this document. The name of country and state is also given in the end and this is the place where blank vehicle bill of sale is being signed.